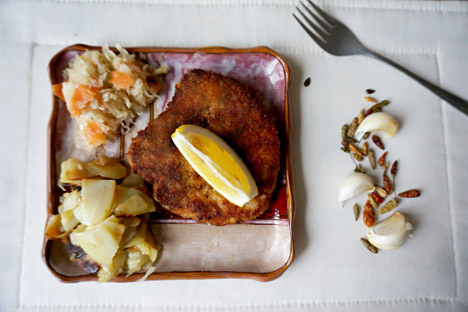 Despite its German origins, pork schnitzel was a common dish in Soviet cafeterias. “This just looks like a German meal!” A friend of mine who had stopped by said as I was photographing this week’s dinner: schnitzel, pickled cabbage and fried potatoes. He’s moving to Germany to study and was excited by the sight. I was surprised that the Russified schnitzel kept its name instead of getting a Soviet ‘nickname,’ like some other food items. Granny says schnitzel was always available in the cafeteria– very thin and covered in bread crumbs. She never ate it though, as it looked suspicious: What could those crumbs be concealing? So despite the fact that Mun’ka, my great-grandmother, grew up not eating pork, she certainly cooked it, and my grandmother acquired quite the taste for pork crackling. I don’t think I got the pork gene, although I have to admit the schnitzel turned out very nicely. My great-great-grandmother moved to Palestine in 1925 – actually the whole family did, with the exception of 22-year-old Mun’ka and one of her brothers. Mun’ka and her mother never saw each other again, but they kept in touch by mail until diplomatic relations between Israel and the Soviet Union were cut off. Corresponding with anyone abroad was a very brave thing to do, and that added to Mun’ka’s overall heroic image in my eyes. Sharing her experiences of adjusting to life in the new country, my great-great-grandmother Sure Hana wrote about how outraged she was when a local vendor at the market sold her a bucket of potatoes, which she discovered when she got home only had a few potatoes at the top – the rest of the bucket was full of oranges! Mun’ka, who later traded one of her mother's silver spoons for an orange for her own young daughter, was amazed at just how different her situation was. “And now,” Granny noted, “can you believe they sell Israeli potatoes in the shops here, in Moscow! That’s absurd! Write ‘absurd’ in your blog, because you’ve seen it, too!” She instructed me. At least I’m pretty sure the good news is they still don’t sell Russian oranges in Israel, so all is not lost. Austrian schnitzel, Israeli potatoes, probably-Russian pickled cabbage – all were very much enjoyed by the Jewish, Russian, Australian and Armenian diners at my table. It's amazing how unifying a dinner table made up of Soviet dishes can be! Take pork chops or a piece of pork cut into chops with no bones. Wash and season with salt and pepper. Dip each chop in beaten egg and then into breadcrumbs. Heat a pan over medium-high heat. Add butter or oil. Fry chops on both sides until crispy golden brown. You can fry either boiled or raw potatoes. Raw potatoes are tastier, but they take more time to cook. Cut boiled potatoes into slices. Put in a single layer in a heated pan coated with oil or butter. Add salt and fry, stirring, over high heat for 5-10 minutes. Sprinkle with parsley or dill to serve. For raw potatoes, you can fry them immersed in heated oil. For raw potatoes, cut into slices, cubes or strips. Wash them, then lower into hot oil and fry, stirring occasionally, until golden brown, approximately 10-12 minutes. When potatoes are ready, remove them from the oil with a slotted spoon, place in a colander and sprinkle with salt. Fried potatoes can be served for breakfast, or for dinner with cucumbers and tomatoes, or use as a garnish for grilled meats or fried fish. You can also add fresh or pickled apples, sliced celery or fresh cranberries.